The Basque Coast is the birthplace of surfing in Europe where you will find, here in Guethary as well as all along the coastline from north to south, an impressive number of great surf spots for surfers of all levels. Let’s start with Guethary that shares with Bidart the legendary Parlementia wave. You can get there from Guethary port or from the north of Parlementia Beach. This reef break has the distinctive feature of starting to break quite far away from the coast and holds out in bigger swells, guaranteeing a beautiful sight to admire from Guethary’s panoramic terrace. Access is rather complicated (due to the numerous rocks between the shore and the wave); it is reserved for skilled and experienced surfers. More accessible to surfers of all levels, further south is the Cenitz surf spot and its beautiful lush creek. It is also a reef break. Between the two spots, which only 1 kilometre separates, you will find no fewer than 2 waves reserved for skilled surfers: the Alcyons (facing the port) and Avalanche (that only appears with a certain amount of swell). When in Saint-Jean-de-Luz, don’t miss out on Lafitenia and its wild creek (for fairly experienced surfers). Beginners’ paradise is a 3-minute car drive north from Guethary, in Bidart centre with its beach break and lovely sandy beach surrounded by cliffs that is perfect for families. You will also find 2 surf schools here for that matter: L’Ecole des Vagues and the club Bidarteko : ideal for a first surfing experience regardless of your age. In Bidart, you will also find the school H2O on the large beach Uhabia, as well as L’Ecole de la Glisse, located at the wonderful and wild spot of Erretegia. Guethary also has two surf schools, L’Ecole de Surf de Guethary/Bidart and the Christophe Reinhardt Surf School. 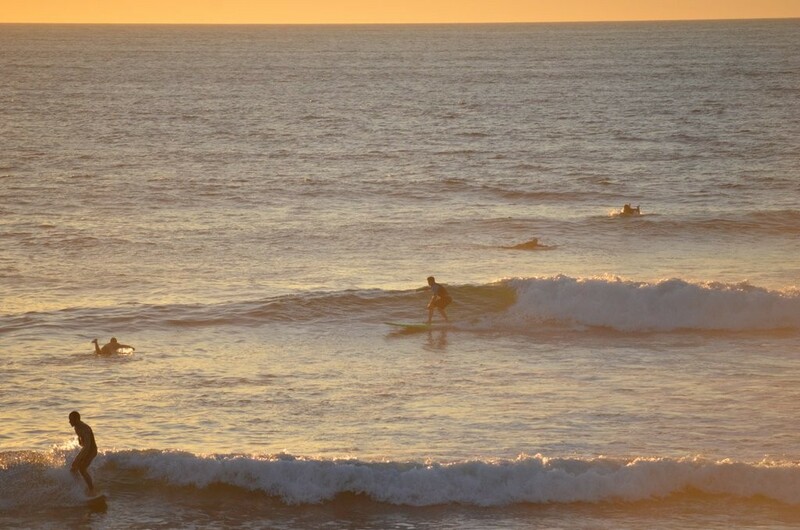 Surfing has become extremely popular and it is possible to begin at all ages, from 4 to 77 years-old! However, it is important to be aware that although you will rapidly experience surfing’s essential sensations, surf spots are often crowded in summer and when the conditions are right. It is absolutely necessary to have sufficient control over your board and understand the rules of wave priority and safety! Once you have acquired the fundamental skills, don’t hesitate to go and discover other legendary spots such as the Côte des Basques in Biarritz (this is the beach where European surfing really saw the light of day!) There are also the sandy beaches of Anglet and their energetic spots and, a little further north, the famous surf spots of Les Landes, from Capbreton to Seignosse, including Hossegor.